Habitat degradation poses a greater risk to the survival of turtles and tortoises than rising global temperatures, according to new research. More than 60 per cent of the group are listed by the International Union for Conservation of Nature (IUCN) as vulnerable, endangered, or critically endangered, because they are being traded, collected for food and medicine and their habitats are being degraded. Understanding the additional impact of global warming and changes in rainfall patterns on their diversity and distributions is therefore paramount to their conservation. The team of researchers from the University of Bristol, London’s Natural History Museum, and the University of California, set out to test if long-term climate change poses a threat or opportunity to turtles and tortoises and how they might respond to increased global temperatures. As turtles live such long lives, it is impossible to conduct experiments to test for the impact of warming over several generations. The group used a novel combination of state of the art climate models and the deep time fossil record of turtles during warmer times. The Late Cretaceous fossil record (66-72 million years ago), dating from the time just before the demise of the dinosaurs, was investigated as a natural experiment to quantify differences between the ecology of living turtles and tortoises and those living in an earlier, warmer greenhouse world. 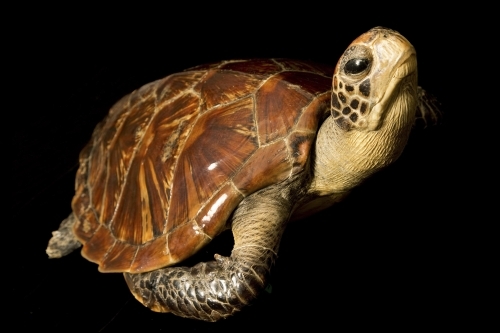 The results of this study, funded by the Natural Environment Research Council (NERC) with support from The Royal Society, show that during periods with much warmer climates, turtles and tortoises were able to stand the heat in the warmer tropics – as long as there was enough water to support those species living in rivers and lakes. Turtles and tortoises are highly sensitive to changes in temperature and rainfall, hence concerns about the impact of climate change on their distribution. Alongside overexploitation and habitat loss, climate change is a significant threat to their conservation status with growth, abundance and geographical ranges all predicted to decline under future climate change projections. In many species, temperature determines if the egg will develop into a male or female showing a direct impact of warming. As the group lives in ponds, rivers, on land and in the sea climate change can impact them via changes in temperature, rainfall, and major ocean currents. Paper: ‘Modelling the climatic niche of turtles: a deep-time perspective.’ By Amy M Waterson et al.Published in the Royal Society of Proceedings B.